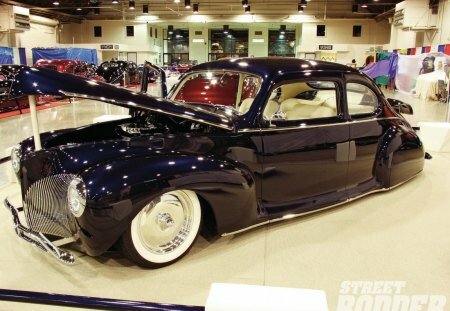 Another custom that demanded more eye time was Bryan Loder’s dark blue ’40 Lincoln Zephyr from Kent, WA. Tim Norman was the designer and builder on this one, and he did the white upholstery in the car, too. The interior wasn’t traditional but rather contemporary, and the engine under the hood was a 465hp, 540-inch Chevy.